Vancouver Island, a large island in the Pacific Ocean off Canada's west coast, was once a separate colony from British Columbia, which it is a part of now. Vancouver is the name of the third-largest city in Canada (largest in BC), and oddly enough it is not on Vancouver Island, but on the mainland. The city was not founded until the late 1880s. The capital of BC, Victoria, a much smaller city than Vancouver, is on Vancouver Island. Confusing? You bet! Vancouver Island was a separate Crown Colony from 1849 until 1866 when it was united with the Colony of British Columbia. A Blue Ensign with the Vancouver Island badge in the fly, is depicted above. It is very unlikely that this flag ever existed. Although Vancouver was a Crown Colony, it was still administered by the Hudson Bay Company. Any government ships would surely have flown the Hudson Bay Company Ensign and not the Blue Ensign? Furthermore, even if there had been an inclination to fly the Blue Ensign, the time scale would have made it almost impossible. The Circular Dispatch promulgating defaced Blue Ensigns for colonial government vessels was dated 22nd December 1865; Vancouver, as a separate colony, ceased to exist after 6th August 1866. Would anyone have bothered with a flag that was going to be out of date in just over seven months, even supposing they were aware of the new style flag in time? It took five years to produce the Canadian equivalent. Given the fact that Vancouver Island was part of the Hudson Bay Company proprietorship, such a flag would be very tentative. In 1682, the Hudson Bay Company prescribed that the King's Colors would be flown on all ships entering its territory, apparently taking a liberal interpretation of the grant that because the company was authorized to provide "Shippes of War Men or Amunicion unto any theire Plantacions Fortes Factoryes or Places of Trade aforesaid for the security and defense of the same." If the flag dates prior to the one mentioned in my earlier post, then it's one of a kind, and would not have been common in Vancouver Island. I have not yet found any information rescinding this order by the Hudson Bay Company. The badge is derived from the Great Seal of the Island Colony and was designed by Benjamin Wyon, an engineer with the Royal Mint. The trident represents King Neptune, God of the Sea, and symbolises the water surrounding the island. The wand of mercury with two snakes represents commerce while the pine cone stands for the forests. The beaver is symbolic of the fur (*) trade. This symbol refers to the Hudson's Bay company, which was founded to conduct the fur trade in the watershed of the Hudson's Bay and points beyond. 1783-1849 : Vancouver Island was really not under the rule of anybody. Ownership of the Pacific Northwest was under dispute between the USA (manifest destiny, 54-40 and all that) England (Captains Vancouver and Cook) and Spain (Captain Quadra). Have a look at a map of the area-- Vancouver and Quadra met, put aside their European differences, and cooperated in mapping the place. That's why there's Spanish named Islands with English place names on it, English and Spanish water names beside each other (Georgia and Haro Straits), etc. When the 49th parallel was looking to become the US-British border past the Great Lakes, England decided to protect itself against the American desire to inhabit everything south of Latitude 64'40", by letting out a contract to colonize Vancouver Island, which straddled the 49th parallel. 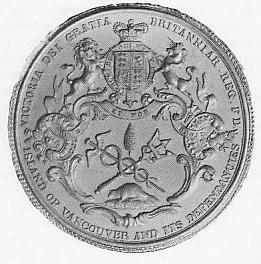 The Hudson's Bay Company won the contract and founded the colony of Vancouver Island at Victoria in 1849, on behalf of the British Crown. At the same time the Hudson's Bay Company abandoned Fort Vancouver on the mouth of the Columbia River (another Vancouver, but this one is in Washington, across the river from Portland, Oregon). The Mainland, as the rest of the province is known, was annexed by the governor of Vancouver Island, in 1858, when gold was discovered in the interior, and Victoria was flooded with gold seekers traveling from the remains of the 1849 California gold rush. This again to protect British territory against the threat of manifest destiny. The combined colony of British Columbia voted to join the confederation of Canada in 1871. So the beaver in the seal, and the badge, refers to the company that organized the official European colonization of the Pacific coast of Canada and helped protect it against the forces of American expansion that were swallowing up Texas, Louisiana and California at about the same time. Maps of the late 18th century refers to this area as New Georgia (as in Europe, Russia and Alaska). So you can see that Vancouver Island was quite a popular place. Vancouver Island (1849-1866) was never a Crown Colony similar to the mainland Colony of British Columbia. In fact, it was a 'proprietary' colony, that is one in which the Crown had granted exclusive control over the Island by the Hudson Bay Company -- the proprietors. I have read that the trident is more correctly viewed as symbolic of the Royal Navy base at Esquimalt, it beginnings dating from the time of the Crimea War as opposed to water surrounding the island. The beaver is symbolic of more than the fur trade but specifically Hudson Bay Company's proprietorship of the Island. Vancouver Island was originally claimed by Spain before Captain Cook's Third Voyage of Discovery brought world attention to the lucrative sea otter trade. After the Nootka Convention of 1795, both Spain and Britain agreed to joint sovereignty between 54 degrees 40 minutes latitude (south end of the Alaskan Panhandle at Portland Canal, a dividing line originally agreed to between Spain and Russia) and the boundary of Oregon and California, 42 degrees. Once Spain receded from the coast, the United States "inherited" Spain's prior rights of discovery that pre-dated Britain's own (Juan Perez). As a consequence, Britain and the U.S. held this territory under a period of joint-sovereignty until the Oregon Boundary Settlement of 1846 which established the 49th parallel giving Britain Vancouver Island. The Mainland was not correctly speaking "Annexed" to the Island Colony. The Island House of Assembly had made initial attempts to do so, but this was never followed through. Until the Crown Colony was proclaimed in 1858, the mainland was not constituted British territory. I have recently written to Sir Conrad Swan, KCVO, PhD, FSA, formerly the head of the Royal College of Arms, England, and author of "Canada: Symbols of Sovereignty" who is inclined to agree with me that it would have been more likely that Vancouver island would have flown a Red Ensign -- as opposed to the Blue Ensign due to the Hudson Bay Company having been awarded the Island. Generally, colonies that were "discovered" by the military (Royal Navy) flew Blue ensign flags (Australia, New Zealand), while > those that were discovered by merchant marine flew the Red (Jamaica for instance). The fact that the Hudson Bay Company controlled the Island and was flying the Hudson Bay Company Red ensign suggest that, if the Island flag ever flew over the Island (doubtful, of course) then it would have been the red ensign with elements of Wyon's Great Seal placed in the fly. I think that the distinction between Red and Blue Ensigns in this context is chronological, not military/commercial. The Red Ensign was the flag of not only merchant ships, but also of the senior squadron of the Royal Navy and the flag generally used by small squadrons and individual naval ships detached from the fleet. It was therefore much more widely used than the Blue Ensign until 1864 when defaced Blue Ensigns were established as colonial naval flags. There was an article in Friday's (29 Aug 03) National Post on the Vancouver Island Flag. The author acknowledges that the flag may never have flown. :The gentleman was Michael Halleran, a mild-mannered paralegal and vexillologist -- one who studies flags. "I think it was in 1985," he says, on the telephone from his office in Victoria. "I had been in the provincial archives, doing some research into another matter, when I came across some correspondence between London and Victoria relating to a colonial flag. I did some more digging and came upon the name of the man who designed the badge that ended up on the flag." Benjamin Wyon was the British Empire's Master of the Royal Mint in the 19th century. He had designed medals for British soldiers who had participated in the Battle of Waterloo, and at some point, he'd also been commissioned to produce badges for the new colonies. The Colony of Vancouver Island, formally established in 1848, was at first administered by the Hudson Bay Company. Hence the beaver at the bottom of Wyon's badge. He added a wand of Neptune, God of the Sea, and Mercury's wand of commerce. He also tossed in a pine cone, to represent the island's forests. Wyon did not produce badges for the colonies, he produced seals. If there had been a Blue Ensign badge it would have been based on the design in the lower panel. The Vancouver Gazettes for the years 1864 to 1866 have no reference to a Vancouver Island Blue Ensign, which, had it existed, would probably have been announced in the Gazette; and there are government notices inviting tenders for the provision of maritime services, which suggests that the Government of Vancouver operated no vessels, and therefore had no need of an ensign.